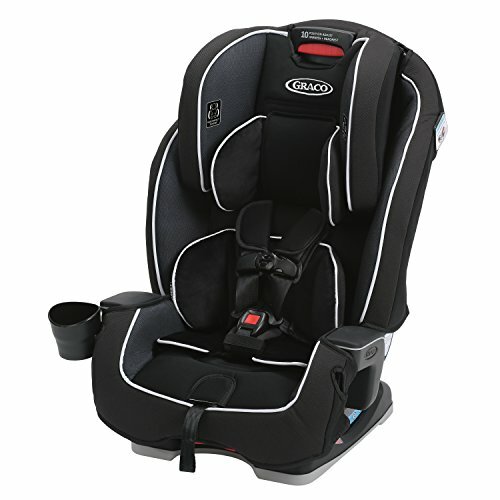 The Graco Milestone All-in-1 Car Seat grows with your child. It's three seats in one, for comfort at every stage! It's a convertible car seat with rear-facing (5-40 lbs. ), forward-facing (20-65 lbs. ), and a belt-positioning booster (30-100 lbs.). Thanks to the Simply Safe Adjust Harness System, you'll adjust the harness and headrest together, for an always-right fit. The 4-position recline keeps your child comfortable, while the InRight LATCH system makes installation easy with a one-second attachment. The seat is side-impact tested and Safe Seat Engineered, giving you peace of mind. With loads of safety features, Milestone is a smart and practical car seat choice! Buckle may be cleaned with a damp cloth.